Topic: What are the pros and cons of AWD on a vehicle? Re: What are the pros and cons of AWD on a vehicle? Ringo Flinthammer wrote: Not really where I thought this topic was going, given the title. There's still a chance that it might! You might find this useful. It's an article on WoW Insider that is a summary of their other articles about Paladin changes for Wrath. Topic: October 14, 2008: Patch 3.0.2, "Echoes of Doom"
Re: October 14, 2008: Patch 3.0.2, "Echoes of Doom"
I logged on last night and was overwhelmed with having to look at consolidating my Priest's gear sets, glyphs, mounts and pets, new specs... eventually I just said, "Screw it. This is too much. I'm going to Kalimdor to work on my Exploration Achievements." 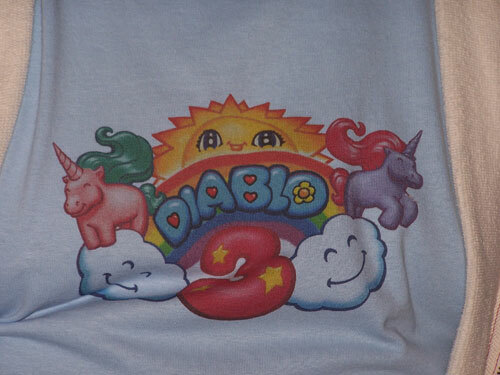 I know a lot of people are upset with the new art direction for the Diablo series. Check out the WoW front page. There's a news item there that instructs you on how to opt-in for the Blizzcon ticket lottery and how long you have to do it. You guys might be interested in this. It's an apology from Blizzard about the way BlizzCon tickets were handled, and he talks about a forthcoming lottery for 3,000 additional tickets. Possibly not sold out, but it's hard to tell. The linked article reports that the tickets are sold out, but then edits 1 and 2 at the bottom of the article are saying that this is just an error, but then edit 3 says that "sources" are saying sold out, again. It's hard to say. What's the mod you have that puts the creature tooltips at the top of the screen? Mine always covers up my second chat window. My fiancée got the Fiery Warhorse's Reins drop from Attumen. I have to admit that it does look pretty cool. Make sure you take care of it! Feed it lots of... um... well, maybe you shouldn't feed it. Maybe starving an undead horse is how you take care of it?